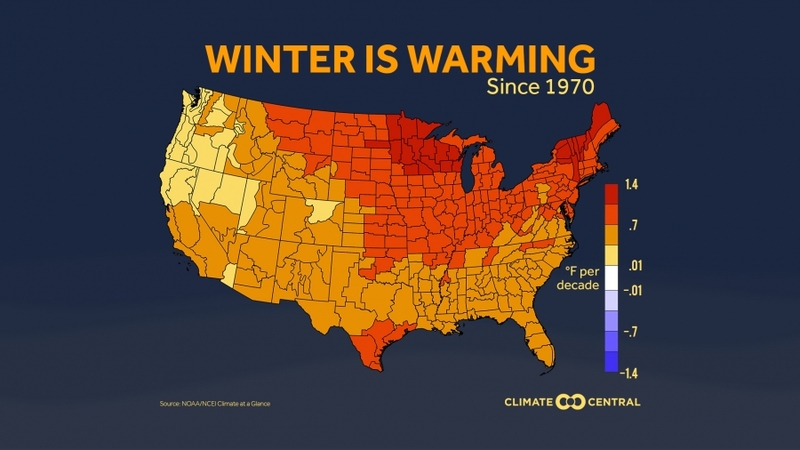 Winter is the fastest warming season in most of the country generally from the Front Range of the Rockies to the East Coast. The greatest warming along the northern states emphasizes a general rule of climate change — cold areas and seasons warm faster than areas and seasons that are already warm. But there are a few exceptions. Fall is warming the fastest in the Pacific Northwest, and spring is warming the fastest the Southwest. Summers are the fastest warming season in Texas. Warming winters may sound nice to some who prefer more moderate temperatures, but milder winters can signal more difficult times for industries that economically depend on cold winters. Tourism and recreation may suffer when mild conditions negatively affect skiing, snowmobiling and ice fishing. In the West, the warmer winters can lead to faster snow melting and less snowpack, which can stress water levels in reservoirs for areas that depend on melting snowpack later in the year for both drinking and agriculture. Plus, it can lead to drier vegetation and soils, raising the risk of wildfires. Warming winters also serve as a reminder that hotter spells are becoming more frequent and more intense when summers return. METHODOLOGY: Each city's winter temperature is calculated using the average temperature for December, January, and February via data from the Applied Climate Information System (ACIS). Data begins at 1970, which is the earliest reliable data is available for all of the cities analyzed across the country. National trends are compiled from each NCEI climate division.